I groped my way out of Silverthorne this morning along a series of confusing bike paths. Just when I thought i was home free, I came up on the tail end of a large breast cancer awareness walk. For nearly 10 miles, I weaved through a parade of people wearing pink shirts and waving balloons shaped like breasts. At first I cheered them on, but after four miles, I began to feel herd weary. I blew through Breckenridge and ran into my third human traffic jam up Boreas Pass, with Sunday drivers and bikers crowding the narrow road. I dropped down the pass into much more lonely country, wide open country without even a tree to pee behind. I was slammed by a couple heavy thunderstorms, dropping hail and mixing up mud. I was pretty muddy when I rolled into Hartsel, which was teeming with bicycle tourists traveling the trans-America route. Everyone was curious about my mountain bike and muddy state, so I spent more than an hour chatting with fellow travelers, including a vehicle-supported group traveling cross-country to raise awareness about affordable housing. They weren't very impressed when I told them I was averaging 100 miles a day. Sigh. Roadies just don't understand. Roadie or not, averaging 100+ miles a day is AWESOME! I'm loving the virtual ride. Thanks for keeping us updated. Best wishes for a fun and safe adventure. You're rockin! Just keep spinning. You can do it. Thanks for keeping us updated. I cringed when you wrote about the supported group raising money for affordable housing. I went coast-to-coast last summer with a group for just that purpose and was worried it was my people that were not friendly to you. But then I remembered that my team is going from Michigan to Florida this year. They escaped a finger-wagging. Not impressed? Sure, we did 100 mile days, but we had it so posh, and we were done by lunchtime. Count this roadie as one who is VERY impressed even though - admittedly - I don't understand, as you say. Congratulations on your progress so far, may you stay safe and continue to meet good people along the way! You're really cruising along now. Way to go! The SPOT mapping system is great; almost like being there. I think I saw you on the trail near Steamboat Spg. Good luck! Glad to read you are still moving on and covering amazing ground. I'm really looking forward to seeing some of the photo's I'm sure you've been taking - the descent today sounds breathtaking. Hope the knee is healing well, the brakes are again reliable and the freewheel is only freewheeling when you want it. I bet on a high pass you can almost SEE Mexico now...can you smell the Tacos??! Anyone who's not impressed by what you are doing is simply not paying attention! Keep spinning those cranks, Jill. You have plenty of people cheering for you who are quite impressed (and maybe a little intimidated) by what you are accomplishing. will u bear my kids? Can you taste it? I hope you break the record. Awesome job Jill! A couple of us were up on Boreas Pass this past Saturday riding from Kenosha Pass over to Breckenridge and then over to Como. Sorry we missed seeing you but keep it up, your doing awesome! Great job Jill. A buddy and I rode from Breck to Salida the day before you on the route. What a fantastic one, we really enjoyed it but were sorry we were a day ahead of you. Submitted by smorris on July 1, 2009 - 9:06am. Pete was released from a hospital in Pueblo last night. That's a very good sign. The word is that he has broken bones in his arms, but no critical injuries. I've said it before, you make the rest of us look puny but in a nice way. You don't rub our noses in it. It's been 5 or so days now and I get worried when you don't report in on a regular basis. You are giving the GDR a great run in the toughest conditions ever! I am in awe. I nominate Jill Homer as the New replacement for Sarah Palin. She's made Pie Town and closing in on the finish. SOO EXCITED to watch your progress! I see you're in Silver City, hope you're able to find some good food (mmm, burritos...of course Combos & Diet Pepsi is also a breakfast of champions). 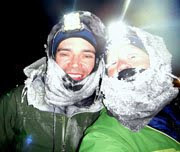 I wonder if Tarik (http://tsaleh.blogspot.com/) will meet you at the finish like he did for Kent (Mountain Turtle) Peterson. If anybody could hook you up with good burritos it would be Tarik. Sending best wishes for a safe, enjoyable trip to Antelope Wells and beyond--GO JILL!! I think she might be riding to Tierra Del Fuego. Best I can figure is Jill is about 9 miles from the finish line at Antelope Wells July 06, 6:19pm central time. HIP HIP HOORAY JILL !!!! Looks like you are there! Congratulations!! SHE DID IT--YESSIRRY BOB! Am too cheesy for public consumption--fill in your own happy dance. Jill, I have no words for how happy I am for you. The "spot" has reached the border. Congratulations! Awesome! Congratulations!!!!! Just saw your spot at the border! Good on ya! My cold black heart is strangely moved by your tenacity. Congratulations Jill. Most excellent effort. I hope they had a tall frosty diet Pepsi at the border! Congrats on the finish;) That's an amazing achievement!!! yeah! brian and i were following you on our way back from being out fishing. CONGRATULATIONS!! wow, so many comments on your blog lately its become more of a bboard then a means of communication but I wanted to say it's great to read your posts here on the GDT because they give such a unique perspective. For example, your freewheel scare. And this post... a sort of surreal day packed with happenings, unexpected coincidences (RAAM was it?) and lots and lots of people. This right in the middle of 24 days of grueling isolated riding. Most have been fun but surreal. Though cool events like this when out touring always give me a bit of an odd feeling. It's like walking into some one's living room saying hello, witnessing an odd bit of their life as if you're invisible and walking on. I find the "culture shock" is a lot less uneasy when I just take a time out in said situations, chat it up, give it due time and appreciation before moving on. Of course, in a race... maybe I'd just blow through. Hard to say.